(03-19-2016, 12:44 PM)Ed1101 Wrote: Several referances to lock/unlocking the SD card. 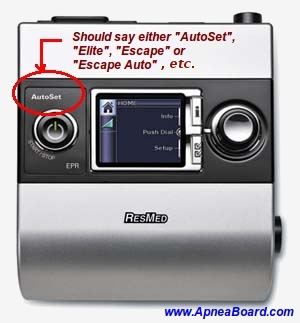 The ResMed Autosence 10 will notify you on the LCD if you fail to unlock the card when you reinsert it back into the machine and turn it on. I have not tested if this machine will allow other hidden files on the card as written by Win 8? It seems that the Resmed S9 model is the only one that doesn't like extra files on the SD card. Resmed seems to have corrected this with the A10 models. I forgot to put my SD card back in my A10 one night. When I discovered my error, I replaced the SD Card. The only data that was written to the card for the that missing night was the summary data. No detail data was written so no graphs in SH. In fact, the summary data is quite limited. At least that is my recent experience with the A10 SD card and data stored in the A10. Hi everyone. Can anyone confirm if this software will work on the APEX ICH machine? I am considering this machine but I want to make sure first that I have access to a compatible software to access compliance data. (05-14-2016, 10:58 AM)egzbuen Wrote: Can anyone confirm if this software will work on the APEX ICH machine? (05-14-2016, 10:58 AM)egzbuen Wrote: Hi everyone. Can anyone confirm if this software will work on the APEX ICH machine? I am including a link to help you with your machine choice, and to be aware of what machines to avoid. I would reccommend only buying a machine that Sleepyhead supports, preferably an APAP. If you don't have insurance coverage and are self paying, you may want to consider buying online. Supplier #2 has good low hour used machines, and new open box machines. Good luck and welcome to Apnea Board. Having problems displaying any data. Running a MacBook Pro11,3 (late 2013) with El Capitan 10.11.6. Downloaded the Sleepyhead beta (could not find anything else) --- v1.0.0-beta-2 (cb213cc OpenGL). 4. After scanning for awhile, it is looking for data and presents a window. Any assistance would be appreciated by this newbie. Try using your file explorer to locate the SD card first and 'recognize' it. Then see if it is possible to import the data. The other possibility is to run a Windows emulator and install SleepyHead inside it. There are several different models of the S9. Which one do you have?